Kicking off a new feature here at NJ Supermarkets, the Look Inside. This is for stores that I have photographed the exterior of but didn't get enough pictures inside for a full tour. Sometimes it's because the store is just too small for a full tour. This time that's not the case! The ShopRite of Passaic, NJ was opened in 1986 as a corporately-owned store under the company ShopRite Supermarkets, Inc., or SRS. It was taken over in 2005 by Rafael Cuellar, whose family had previously owned President Supermarket at 161 Jefferson St in Passaic, where the Compare Foods is today. In fact, the block alongside the Compare Foods is named Evelio Cuellar Square in honor of Rafael Cuellar's father. Cuellar is Wakefern's first and only Hispanic member. 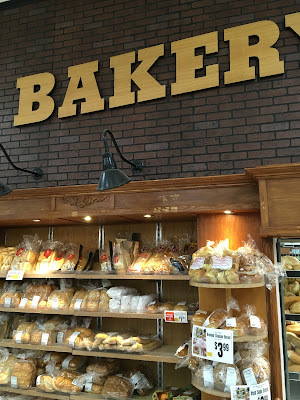 While the whole store is very nice, I particularly liked the wood shelving in the bakery department. I believe this was installed in Cuellar's renovation. Yes, the sign is supposed to be on an angle!